My mother-in-law makes a mean Whole baked chicken. I can’t get enough of it, so much so that my wife was on the phone asking her for the recipe last weekend. She was happy to share her baked chicken recipe and also gave a few tips on the finer techniques of baking a whole chicken. I must say that the experience of baking this chicken is one we won’t forget, since everything was done to the letter and came out like my mother-in-law’s. So we know she wasn’t holding back on any secret ingredient. But on that note, do you know of anyone who does that? They give you a recipe but conveniently forgets about a particular ingredient in the recipe. You will try your best at making the recipe but somehow it’s missing something you just can’t put your hands on. It’s as if the person wants to copyright the recipe before they give it to you lol!!! Anyway, my answer to that is simply ” there is nothing new under the sun“. If they can do it so can I; just a matter of time. So it’s just a matter of time. 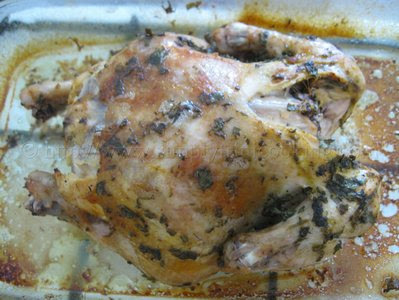 Actually, 1 hour or so for this baked chicken recipe to complete. 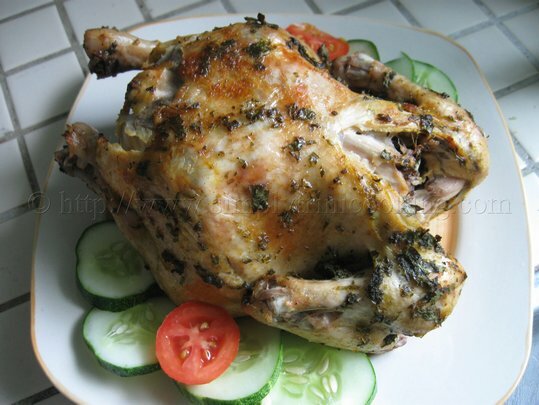 All you need to do is follow the baked chicken recipe to the letter and enjoy it. But you can still experiment along the way if you want . Here’s whole baked chicken trinistyle. 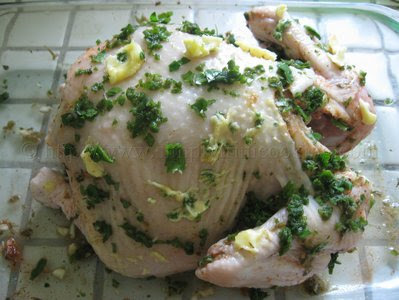 Wash the chicken with the lime and trim excess fat. making sure to place some under the skin. Stuff the inside of chicken with the garlic. 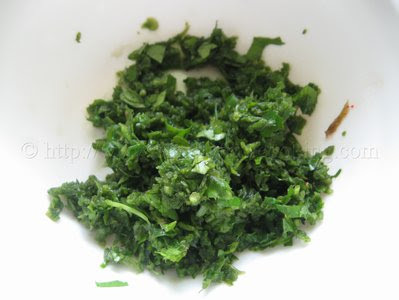 The chopped seasoning: thyme, chive, and culantro. Add the chopped seasoning and dot the chicken, with pieces of softened butter . 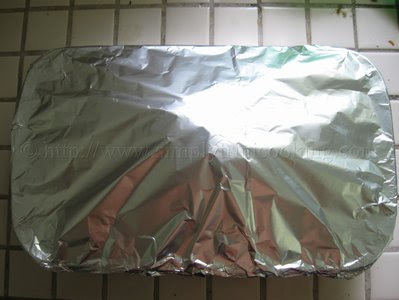 Place in a baking dish and cover the dish with foil. Bake for about 1 hour at 300 degrees F .
Note: After 45 minutes, remove the foil and drain most of the liquid that may have settled around the chicken. You may brush some of this liquid on the chicken as well. 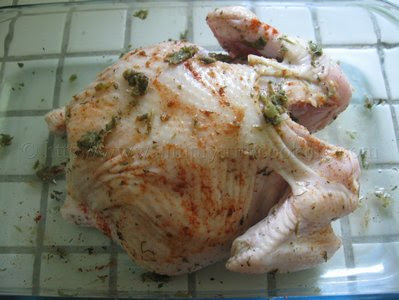 Set aside the remainder of the liquid and continue baking the chicken for the next 15 minutes or until cooked. You can test by using a knife to pierce the flesh, to see if any liquid comes out. 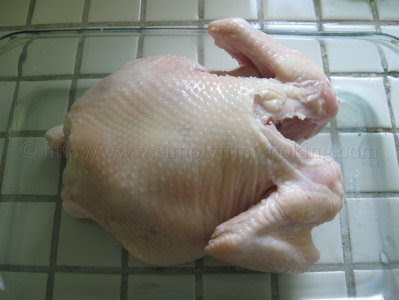 If dry then the chicken is ready. 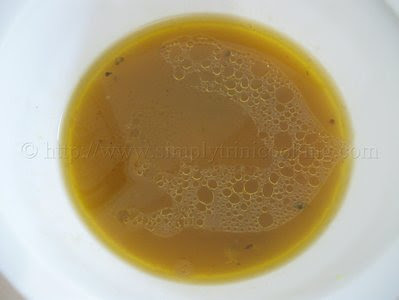 Note: If desired, this excess liquid can also be frozen and used as chicken stock for soups. See how simple it was. I hope you enjoyed this baked chicken recipe. See you soon. Bye!